- My initial plans this winter was to start hiking the winter Adirondack Forty-Sixers list, but with the lack of snowfall and overall generally crummy weather I've decided to wait until the snow falls and the weather is good for views making the five hour plus drive worth it. In the meantime it was time to head to the White's to hike everyone's favorite...Owl's Head! 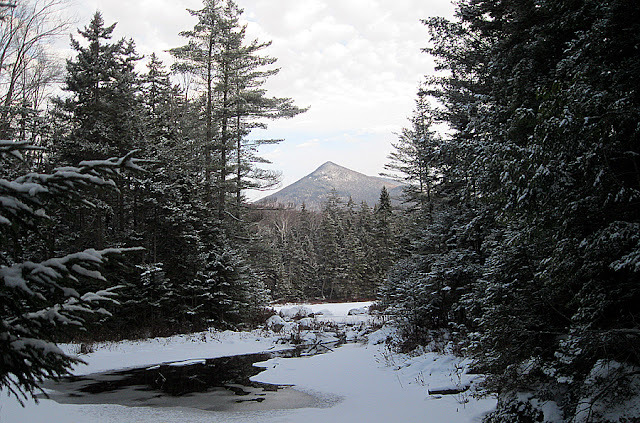 - During the winter Owl's Head is most commonly hiked using the Black Pond Trail and bushwhack along with the Brutus Bushwhack. 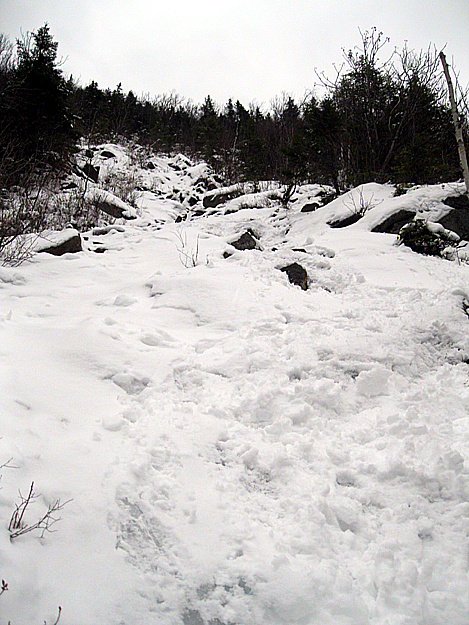 This route is used to avoid the major water crossings of the Lincoln brook and the steep snow drifted Owl's Head Slide. However with the lack of snow this winter Saturday was a perfect opportunity to tackle the Owl's Head Slide. 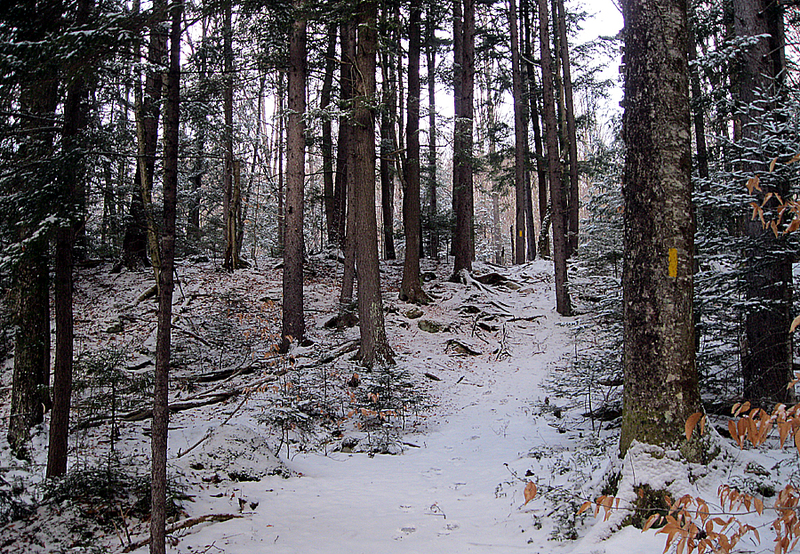 - I arrived at the Lincoln Woods Trailhead just after 7am, put on my microspikes and headed off on the Lincoln Woods Trail which was solid ice with a thin coat of fresh snow over it. - The 2.6 miles to the Black Pond Trail went by fast and when I turned onto the trail I was happy to see a couple of fresh tracks in the snow meaning I would be able to just follow these past the end of the trail onto the Black Pond Bushwhack portion of the hike. - There were decent views of Owl's Head and the Bonds from Black Pond and the pond was frozen over with an inch of fluffy snow on it. I noticed that the hikers tracks I was following walked out onto the pond about twenty feet where the letter F and U were drawn in the snow, I guess they were mad at the pond or something. Looking back now I should have seen this as a sign to just stay put and wait for other hikers instead of following the FU boys Black Pond Bushwhack! - Last winter I found the Black Pond Bushwhack to be annoying, it went up to high and then steeply dropped to the Lincoln Brook trail. As I follwed the FU fellas bushwhack to nowhere I first was relieved since it wasn't going as high but soon was shaking my head because this path may drop me out well below where I needed to be, which was past the first two dicey crossings on the Lincoln Brook Trail. - I soon realized FU Nation must be out in search of old logging roads, skidder roads, or some point of interest because it dumped me out at a tributary of Lincoln Brook with the Lincoln Brook about 100 yards away with remnants of Hurrican Irene right in my way. - I knew I was close to the trail but decided it would be best to turn around and head a half mile back up and just start my own path in the snow similar to last years route. 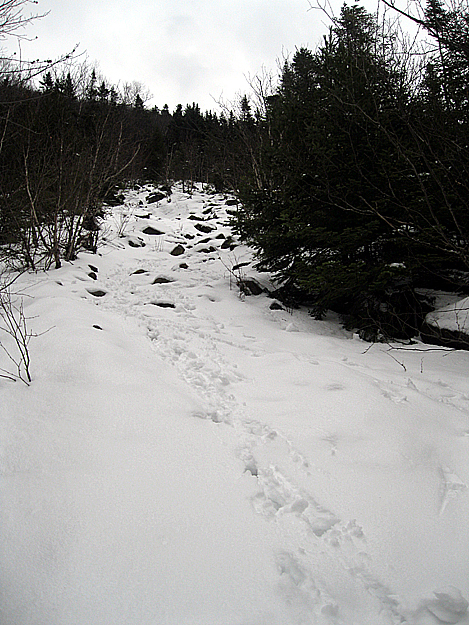 - Luckily when I got back to the spot where I planned to go higher up there were fresh tracks going in that direction set by Marty, Dave, Nick, and their dog, and as an added bonus it didn't go to high up which avoided the steep decent down to the Lincoln Brook Trail. - Once on the Lincoln Brook Trail I caught up with the guys and then zoomed along to the Owl's Head Path where the real fun began. I've hiked the slide route once before in the summer and found it steep but easy but with snow cover it's a lot more challenging. The snow was heavy and sticky and the previous tracks had been filled in with snow so I created my own route being careful in certain spots not to slide back and take a fall. However it was lots of fun and I never felt uncomfortable, unfortunately there were clouds above 4,500 feet so there were no good views. - Once above the slide it was back into the woods and a steep slog up to the ridge and then another slog along the ridge to the true summit which is .25 miles north of the old summit. After a total of nine miles hiking into the middle of nowhere my journey to the summit ended at a small cairn with great views of trees! - After taking pictures of trees I hurried back to the slide for some more fun. I decided to put on my crampons for better traction and carefully made my way down to the base of the slide. It was actually easier heading down then up because the snow was chewed up from ascending it and I knew where and where not to place each step. 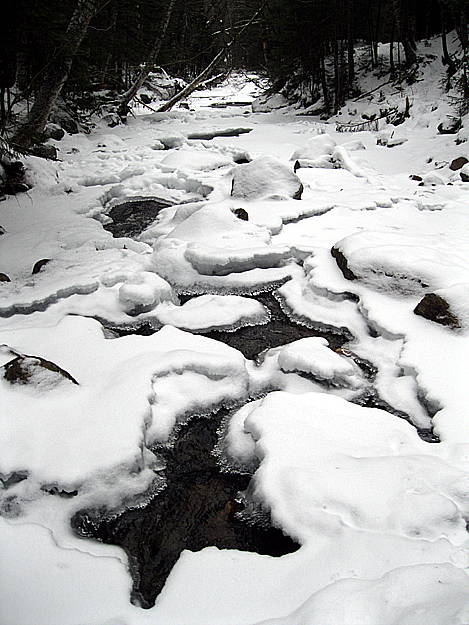 - Once back on the Lincoln Brook Trail I relaxed and had lunch before the long mostly flat walk back to the car. On the way back I ran into two guys who were going to set up camp at the base of the slide before tackling Owl's Head in the morning. - After passing them I picked up the pace the rest of the way and noticed that there were now other paths for the Black Pond Bushwhack, I decided to just stay on the path that the guys and the dog tracked and made great time by the Black Pond. From here it was a 3.6 mile flat walk back to the car making for an exhausting but great 18 mile day in the Pemigewasset Wilderness. Wow! Chris, your report is great, but your photos are probably the best I've ever seen for winter trek to Owl's Head . . . truly superb!